It’s match time! 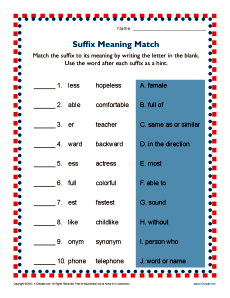 In this worksheet your student will match the common suffix with its meaning. While it’s perfect for 3rd grade Common Core Standards for Reading: Foundational Skills, you may also find it helpful for other students.